Stay with me here, I haven’t gone totally crazy. 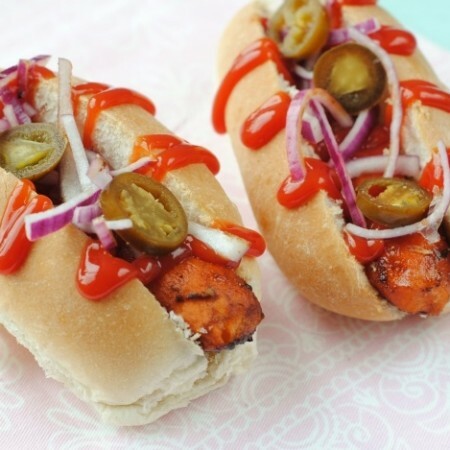 I know there will be someone screaming at their screen saying “CARROTS ARE NOT HOT DOGS!” No, they aren’t, but if you are trying to cut back on meat, don’t like the look of the ingredients in hot dogs, or just want something lighters, then this is a great option for you. Like I say, I am not trying to convince anyone that these taste exactly like hot dogs, but they are a great healthier alternative. I have said it before, and I will probably say it many times again, but for me it is all about the sauce! 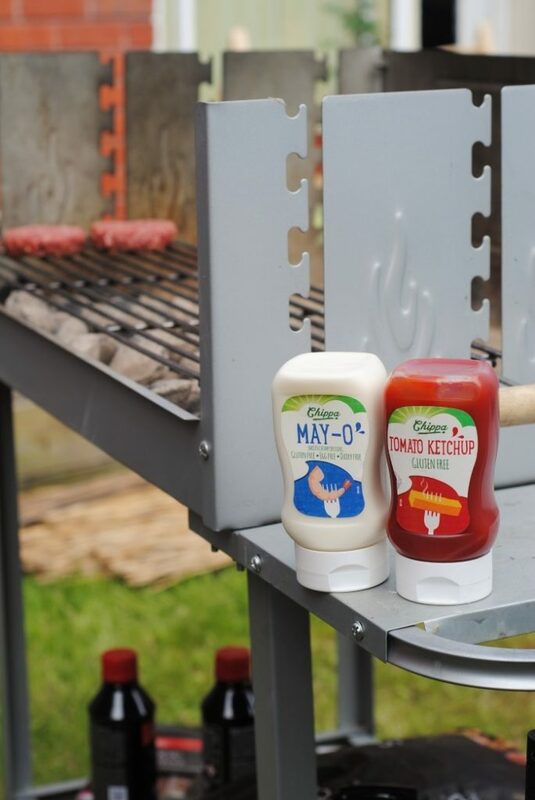 At a BBQ, I smother my burgers and sausages with sauce, so I can’t really taste the meat I am eating anyway. So, why not take out the meat totally, get an extra bit of vegetables in your diet and let the sauce shine though. It’s no secret that I am a big fan of sauces, and my recent sauce recipes are testament to that, but the regular sauce recipes or store bought sauces are not an option for everyone due to allergies or specific diets. Luckily, there is a fantastic free-from range on the scene called Chippa that sell delicious bottles of May-O, ketchup, brown sauce, sweet chilli sauce and Worcestershire sauce. 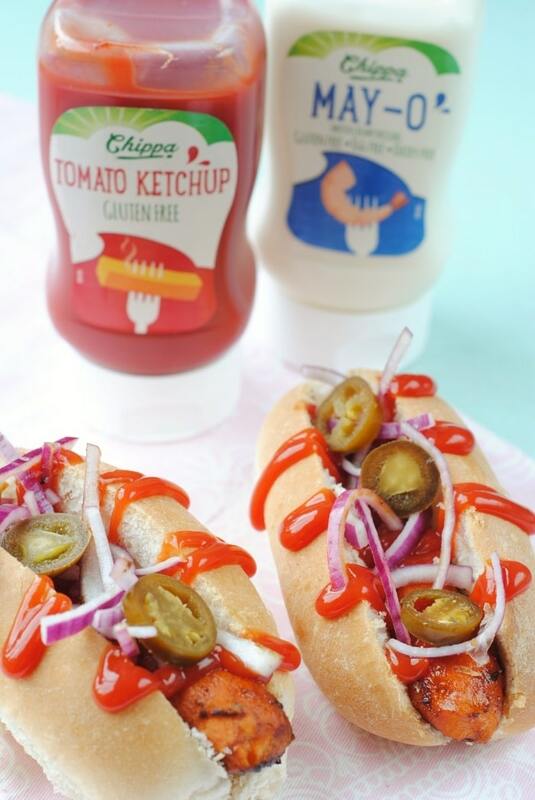 Chippa is Britain’s first free-from condiment range, having launched in July last year and National BBQ Week is the perfect time to give them a try. 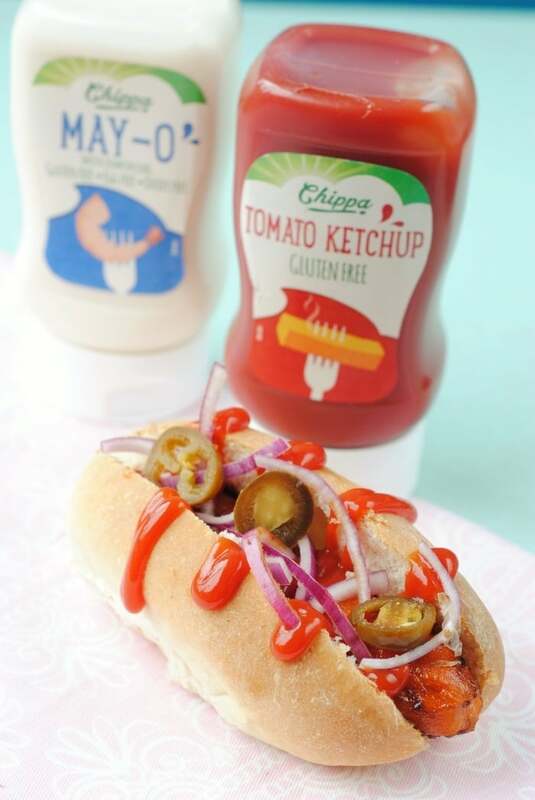 The May-O is gluten free, dairy free and egg free, so it’s a great vegan option. 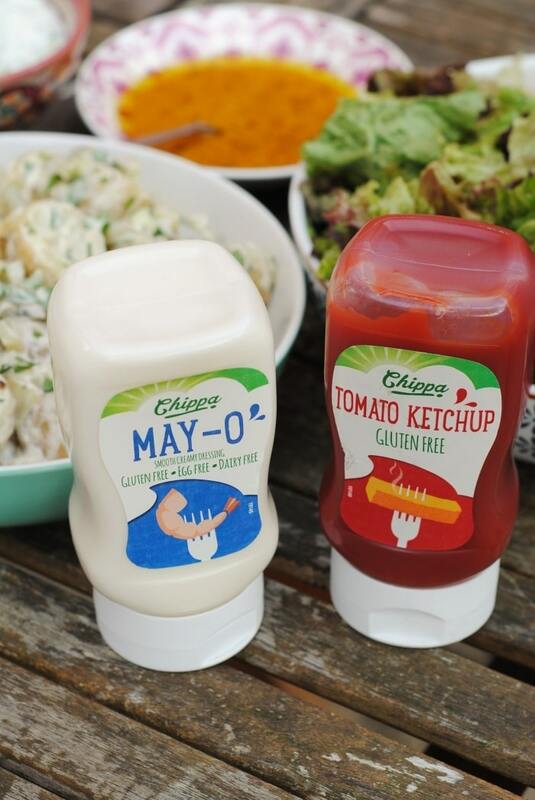 Being a vegan, vegetarian, gluten free or having any kind of dietary requirement can be a bit challenging at a BBQ and doesn’t fill many people with joy at the thought of having another store bought frozen veggie burger with no sauce. How about you wow your free-from friends at your next BBQ by serving up something they are going to love and they can feel like they are really part of the party, with sauce and everything! I have been hearing a lot about using roasted carrots in place of hot dogs recently and I was intrigued. I mentioned it to Dave and I can’t even explain his facial expression – he was confused to say the least. But, the proof is in the taste test and he was totally won over. I mean, I didn’t just throw a raw carrot in a bun and call it a hot dog. These carrots are roasted in a sticky and sweet marinade to really bring out the flavour of the carrot. 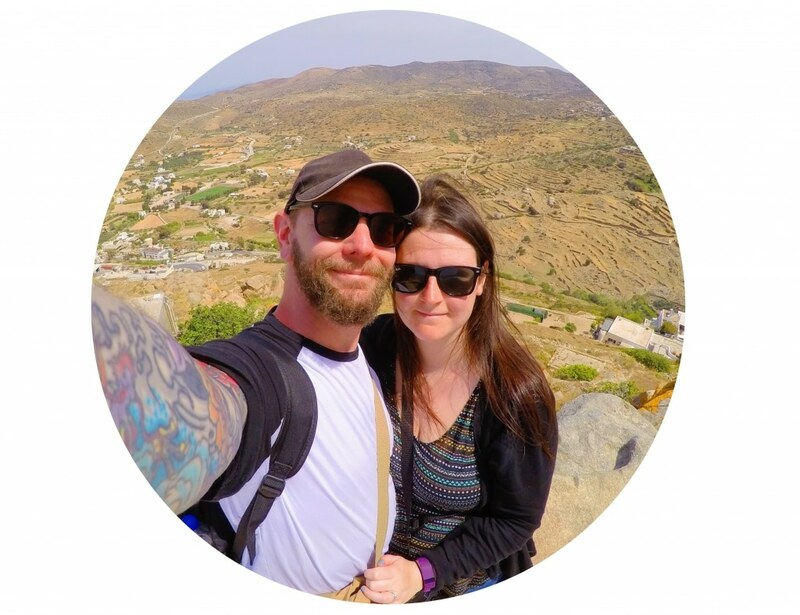 Whenever I am making something a little bit “out there”, I always test it on Dave to see what he thinks and if it gets his thumbs up, then it goes on the blog. This got 2 thumbs up! 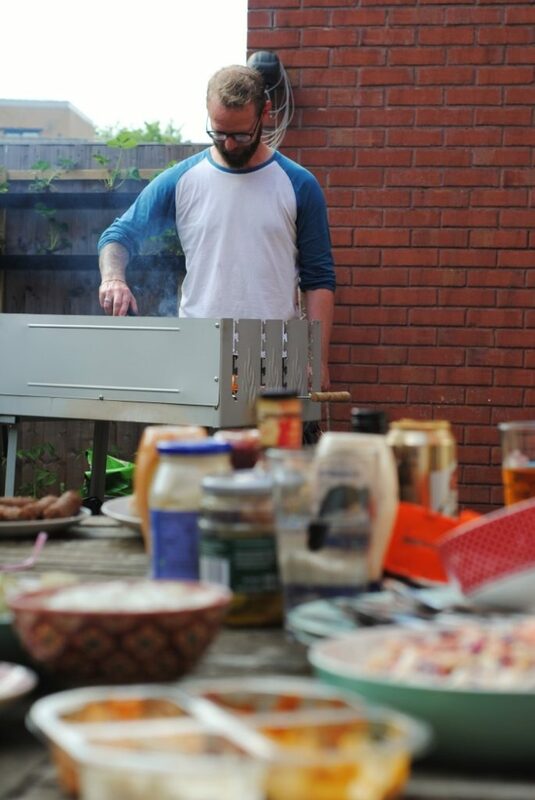 We are in BBQ overdrive at the moment, and trying to have as many of them as possible whilst the weather is still good. Whilst the rest of the country is complaining about the cold, and some people have even had to put their heating on, Manchester seems to have stolen all the sunshine and we are enjoying every second of it. These are cooked in the oven to begin with, but then throw them on the BBQ, brushed with the leftovers of the sauce, for a minute before serving them up. 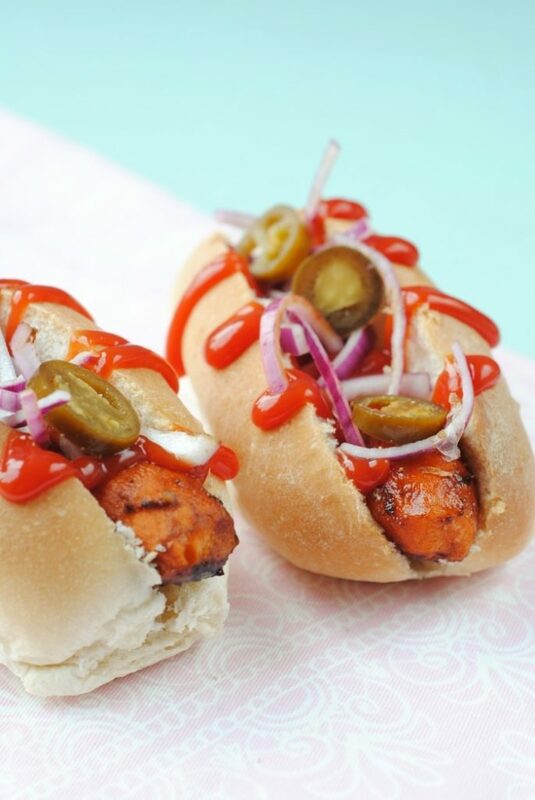 Whilst we are not vegan ourselves, we definitely see the advantages of eating more vegan meals and this carrot hot dogs show just how exciting vegan food can be! 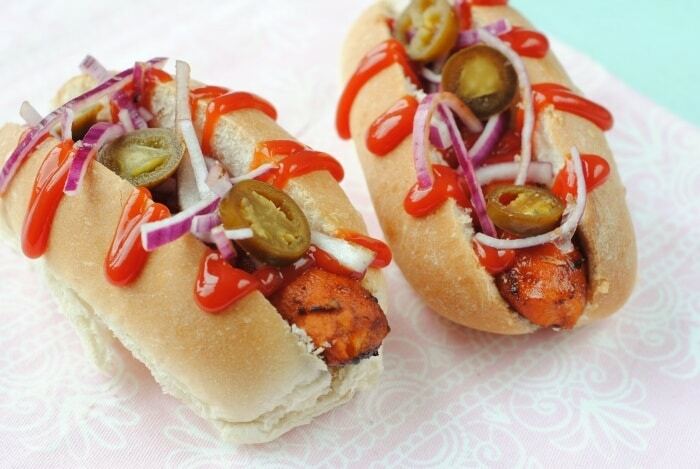 These Vegan Carrot Hot Dogs are cooked in a delicious marinade and are so good, even meat eaters will give them the thumbs up! 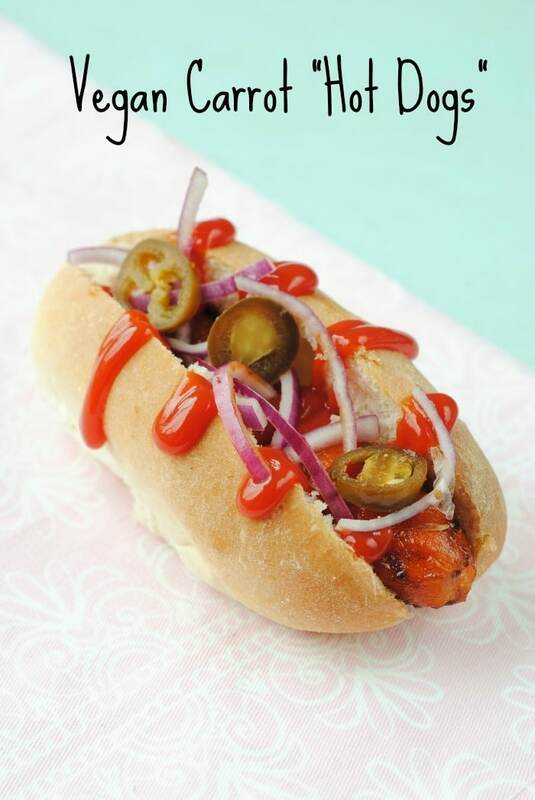 Optional toppings: Onions, jalapenos, mayonnaise, ketchup. In a large dish, mix together the balsamic vinegar, maple syrup, garlic power, onion powder and salt and pepper. Add the carrots to the marinade and make sure they are covered in it. Ideally, put the dish in the fridge for 2 hours, but they carrots can also be cooked right away. Transfer the carrots to a lined baking tray and spoon over a little of the sauce. Put in the oven at 200°C for 50 minutes. Spoon over more sauce every 10 minutes and serve when a fork can easily go into the carrot. 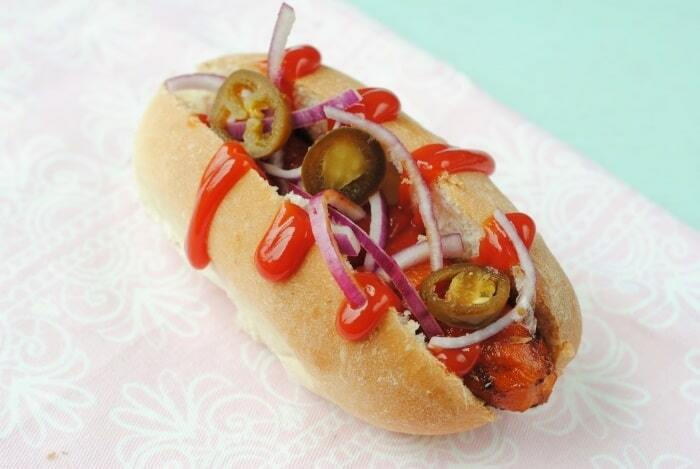 Put the carrots in the hot dog bun and add your favourite toppings and sauces. Well, I have to say, I have been vegetarian for 25 years and this has never occurred to me! Looks gorgeous!